I’ve been wearing them for years, and there’s just nothing to compare to a Karina dress: for ease of wear, flattery, effortless care, pack-ability and just plain feminine beauty. I love everything about this company, from their designs to their founder’s wonder-dog, Bodhi. Karina dresses are made in the USA, with love. They flatter all our different body shapes and sizes, and are supremely adaptable to our personalities. 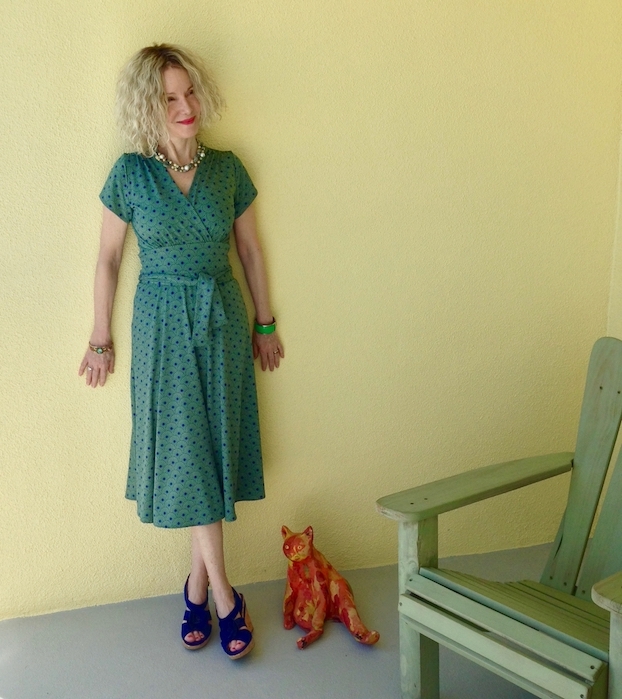 This is the Margaret Dress, my new favorite Karina dress (every time I try one it becomes my new favorite). This one made my husband’s eyes pop – he doesn’t always notice what I wear – and I got a “Wow!” The Margaret has a modest crossover neck that flatters and allows for a cool necklace (mine was thrifted). The Margaret is slightly longer hem than many Karinas, and I love that – so graceful with the swirly cut of the skirt. Love this new green and blue print too; it reminds me of some deco designs. I get a wonderful 1940’s vibe from the Margaret, so I wore my vintage style peep-toe wedges (sim). This great dress is definitely coming to New York City with me next month – perfect for wearing on the plane. Two vintage bracelets add some sparkle. What a very pretty dress my daughter would love it. An it looks amazing on you. This dress is gorgeous. I’ve recently lost 44 lbs and I’ve been looking for the perfect summer dress. Thanks for the chance! Great dresses… hope they come in my size. What a super cute dress! I love the color! I have never had the oppurtunity to try a Karina dress, they look very beautiful! I was just telling my husband that I need to get a few new dresses and start dressing nicer again. I love all of the styles! The Audrey is my favorite though. I absolutely love these dresses! Thanks for the chance to win :)! These dresses look incredibly comfortable and fashionable. I just love the Carolyn Dress – Navy Painted Plaid dress, it’s the one I’d choose. I love the movement of the Karina dresses. Makes me want to go swing dancing! I’ve never owned one of these dresses before and it would be amazing. Thanks for the chance. Love it. Beautiful dress. Thanks for the chance. I just recently lost 19lbs and I would love some new clothes! All of these dresses are so cute and slimming. Such a pretty dress Patti and your blue sandals have the perfect vibe to match with the vintage feel. The shape is so flattering isn’t it? I can see why your husband was wowed by this look because you are stunning! I adore the colors of the dress, too. And the peep toe wedges are perfection! I do not own a Karina dress, but I have admired them for quite some time! I do love when my husband thinks my clothes flatter me! I love this dress! The green is amazing and it looks great on you! That dress looks very flattering. I’d love to win it! I love the longer length of the Margaret dress, and the colour is beautiful. I have a Karina dress, and you’re right – they really are low maintenance but very stylish too. I just need some nice weather so I can wear mine – we had snow today! Gorgeous dress! Love the new style! I’ve always wanted a Karina dress. You look amazing in yours! Thanks for the chance! This dress does look very 40’s in design but the cut and color are SO flattering on you Patti. Getting a WOW! from your husband was NOT about the shoes, that’s for sure! I’m new to your blog and I love it! I love the 40’s vibe of that wonderful dress, which looks so beautiful on you. Such a pretty style on you Patti. Well played! That dress is so great on you Patti! Very spring-like. Thank you for hosting. Love your latest karina dress!!! Love the shape of this dress! Beautiful color on you. I love Karina dresses. Such a wonderful giveaway. Blue and Green for the win! Love those sandals. I am looking for a dress to take on vacation that I can wear a couple of times. This looks like it! Patti, you know I love my collection of Karina dresses and your dress is fantastic on you! Love the fit and the aqua color on you. It is hard to pick a favorite! I love a beautiful figure flattering wrap dress. You look beautiful and I can see why your husband was so complimentary! The blue shoes were a perfect choice. This dress looks so pretty on you! Thanks for hosting the link up! That dress looks great on you, Patti. I’ve yet to get myself a Karina dress. But it’s on my list. I do love the vintage vibe to their designs. Super flattering and they look so comfy! Cute dress + love the shoes! A dress is always a good idea, especially in summer on a hot day. You look lovely. There’s nothing better than a dress to beat the heat! This one looks great on you Patti, effortlessly chic! Wonderful dress and wonderful you. Thank you dear Patti for the lovely link up. The dress has a wonderful cut and looks fabulous on you! 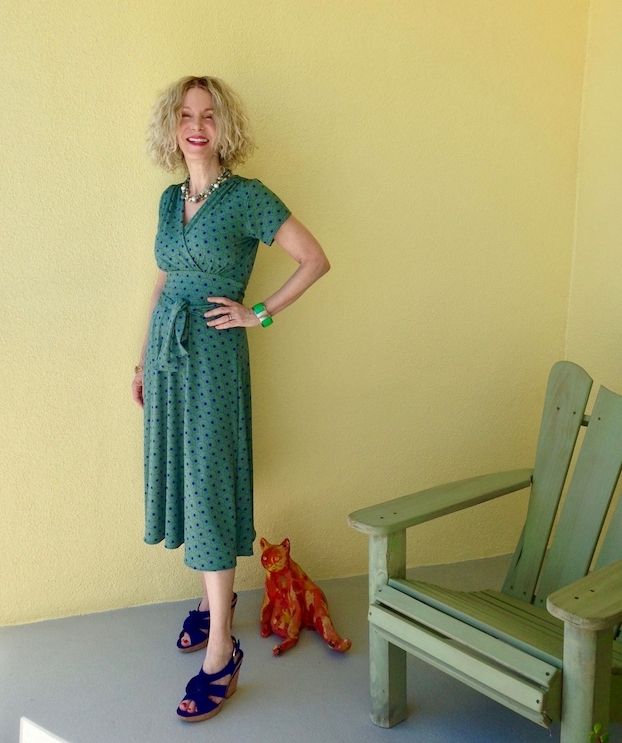 Lovely in your green Karina dress, I agree it does have a vintage vibe. This is definitely one of your best outfits. I love it. Your husband’s right! This is a WOW! dress! Have fun in NY. I’m going this summer. I love the sash on your dress!!!! Patti, the styling and color of this dress is so gorgeous on you! I love a wrap dress – and this one is so pretty! Thank you for sharing Karina with us! I love the Karina dresses. I wish they had more without self-belting and bright strong colors or just solid. Really like the dress, particularly the length – it’s so hard to find a good below the knee length and they’re so much more flattering. I love the dress, beautiful color! Love the dress- and that it’s long enough! I just spent the afternoon on a summer dress hunt and 90% of them were too short! Guess I need to check out Karina…. I agree with Sandy on this one. Wowser. That dress looks beautiful on you!! Just amazing! I’m actually on the lookout for dresses, because I am planning to wear more this summer. I have found two, so far, but hope to find more. I do think that dresses really can be one of our best options for a simple, yet elegant look!! We just watched the movie Hidden Figures, and I loved seeing every woman in dresses!! I think I need to follow suit, now! Ohh that dress is soo pretty AND soo feminine! Thank you for a chance to win ! You’ve got the 4C’s of diamonds here: colour, cut, clarity, and cwality. I understand Sandy’s “WOW” comment. I have a Karina dress which I adore. I should wear it again soon. Love the dress, the color is beautiful! I am so glad to be back to Visible Monday. I’ve been in the process of selling and moving so missed out for a while. Can’t wait to see what everyone is wearing! Peace! You look great! Beautiful dress!! What a lovely dress, Patti! It suits you to a T! I love this style of dress & actually have a few although not from Karina who I hadn’t heard of until now. Thanks for the introduction Patti, they’re really fabulous! That’s a beautiful dress, Patti! You look amazing! I own a Karina dress and love it. Would love to own another one. Hur lÃ¤nge kan man f.n. anstÃ¤lla nÃ¥gon pÃ¥ en projektanstÃ¤llning? Hade detta varit en mÃ¶jlighet fÃ¶r FM att anstÃ¤lla dessa soldater inom nuvarande lagstiftning? Love the details in this dress, Patti! I need dresses…so I am going back to enter! What a beautiful shade of green on you pretty lady!! The wedges are darling with it!